The Edinburgh to Glasgow Relay died in November 2002 – ‘died?’ Maybe ‘put to sleep’ would be a more accurate way to put it. Or maybe it had been on ‘borrowed time’ for some years prior to that. However you phrase it, it left a gaping hole in the calendar and no real attempt has been made to resuscitate it. I’d like to mark some of the highlights from this great race over the next two weeks which meant so much to generations of runners across the land and the likes of which young athletes will never experience. If we start with the inaugural race before going on to some personal memories. The first race was held on 26th April 1930 and the Glasgow Herald report read as follows. “The Edinburgh to Glasgow Road Relay Race was held on Saturday in fine weather and resulted in a win for Plebeian Harriers, Dundee Thistle Harriers being second and Maryhill Harriers third. Keen interest was evinced in the race, big crowds assembling at the various changeover points and lining the route. The total distance of forty four and a half miles was divided into eight relays, the changeovers taking place at Maybury Cross (5 miles), Broxburn (10.5 miles), Wester Dechmont Farm (15 miles), Armadale (20.5 miles), Forrestfield Inn (26.5 miles), Airdrie War Memorial (33.75 miles), Barrachnie (39.25 miles), the finish being at Glasgow Royal Exchange. 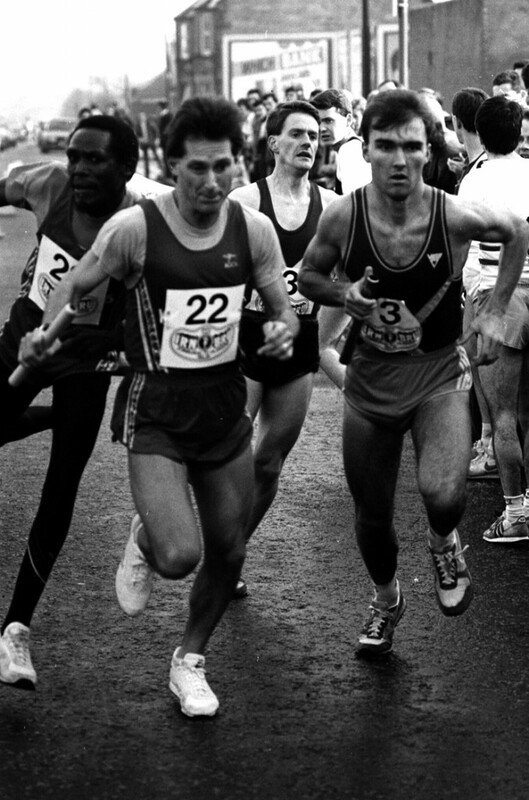 Eighteen of the nineteen teams entered faced the starter, Treasurer Henderson of Edinburgh, in St Andrew’s Square Edinburgh, Eglinton Harriers being the absentees, and 17 completed the full distance, Paisley Harriers being compelled to retire, their sixth runner failing to take over at Forrestfield Inn. As anticipated the struggle throughout lay between Plebeian Harriers, Dundee Thistle Harriers and Maryhill Harriers. The members of the first two teams ran to form or above but there were several disappointing performers among the national champions. Thanks to excellent running by A Ingram, the novice champion of Plebeian, his team was in front at Maybury Cross, Dundee Thistle second. Maryhill third, Motherwell fourth, Irvine fifth and Edinburgh Southern sixth. At Broxburn the positions showed little change, save that Irvine were now fourth, Edinburgh Southern fifth and Motherwell sixth. The next relay saw one of the best bits of running of the entire afternoon on the part of J McNair, Maryhill’s novice champion. So well did he move that when Wester Dechmont Farm was reached, he had wiped out the deficit against him and given his club the lead for the first and only time. Plebeian were second at this point, Dundee Thistle third with Irvine and Motherwell next in order. Maryhill’s lead, however, did not survive the next section, for both JM Petrie, Dundee Thistle, and O McGhee, Plebeian, overhauled A Mitchell and the champions dropped back into third place, with Dundee Thistle and Plebeian in front and Irvine, Garscube and Motherwell treading on their heels. Then followed the most interesting part of the race, and the performance given by WJ Gunn and Max Rayne over the next two sectors, paved the way for the ultimate victory of Plebeian. Leaving Armadale Gunn was 38 seconds behind WS Russell, the Dundee representative, but he moved in his very best form and not only wiped out the deficit but gave Rayne a lead of 30 seconds at Forrestfield. At this point, Maryhill were still third but falling behind, Irvine fourth, Garscube fifth and Motherwell sixth. That report shows us all the ingredients that went to make the race such a success. The lead changing hands at the front with the first two teams at the end of the first stage being the first two teams at the end after an eight man battle all with the way with only short, temporary changes to the pattern. The race for the minor places being fought out and several inter-club duels taking place behind the main protagonists. I say ‘the main protagonists’ but every club was a main protagonist in the race, every one of them fighting for their place. The final sentence in the report indicates that even in unplaced teams, very good running was taking place by talented and determined individuals. For all of us who had the good fortune to run in the race at its best, there are many stand out memories of running individually, or by our clubs, or by other individuals or clubs. I’ll mention some of mine next time.